This is my new Model D. It’s been ages since I made a D, and it’s one of my favourite models. I think I may well have chucked the body mold out during the move to Germany as I searched high and low in the workshop but couldn’t find it. But I came up with a new shape based on my Model S. All the top and bottom bout curves are the same, the difference is just the thicker waist. It’s a lovely elegant shape. 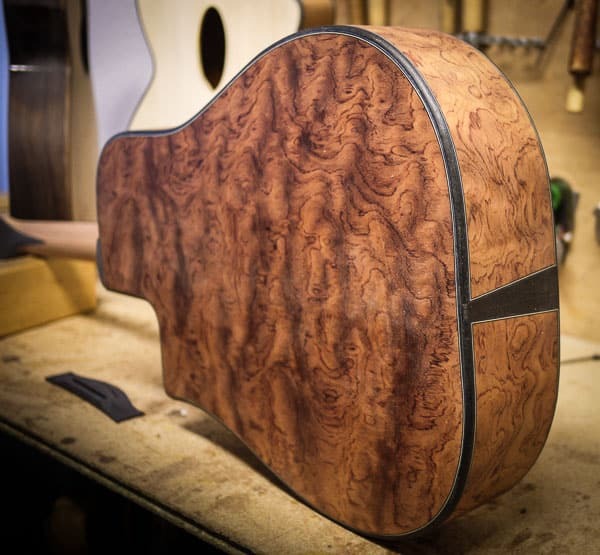 The back and sides are highly figured bubinga, an african wood I’ve used a couple of times now – and I really like it. 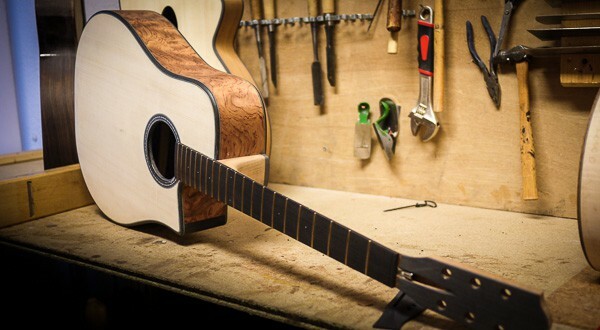 The European spruce top is based on the Sobell design – so this is a Model D-SS. 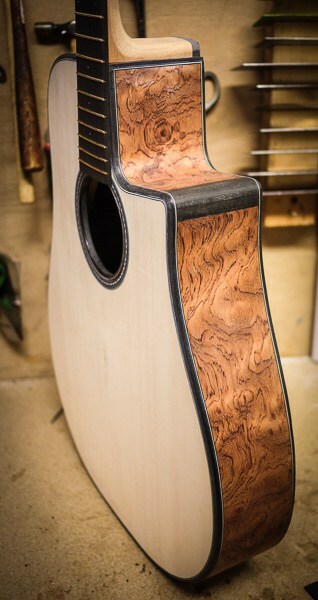 The top and back are “double bound” with an engineered wood – an environmentally sound alternative to ebony. Double binding allows me to shape a heavy bevel all around the whole guitar so it’s a little more comfy. And it looks nice too. The purfling is black white and blue lines and the rosette has a single row of crows foot. 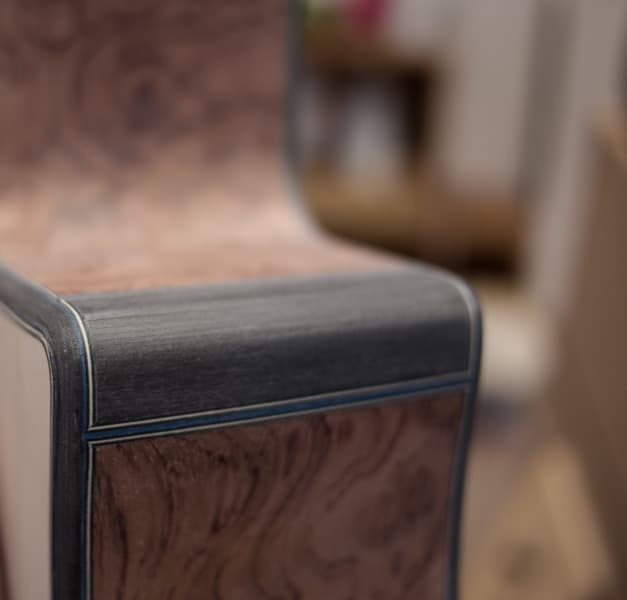 It’s really simple and smart decoration to go with the rather flashy pomelle bubinga. See the black “nose” on the cutaway – this is a tecnique I took from my grandpa Charlie’s old Selmer guitar. 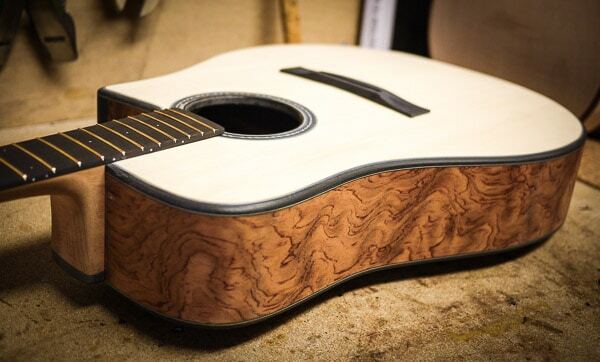 It has an ebony cutaway “nose.” Doing it this way not only looks rather cool, it makes a change from the pointy cutaways I’ve been doing of late and lets you make a very sharp bend – much sharper than the wood allows. I’m hoping to get this one off to the spray shop before the year ends. It’ll be nice to see how she comes out. All the best for the new year to you all.